One of the finest of all annuals, its lovely and fragrant flowers are borne on long stems. 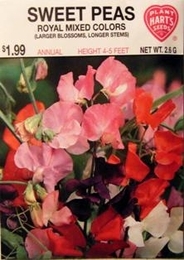 Sweet Peas are unsurpassed as a cut flower. If support is desired train vines to string or brush when they reach 6 inches high. Water once a week by soaking ground around vines. Keep flowers picked to prolong blooming.